This is one musical that I didn’t grow up with, but absolutely love. It’s great on so many levels, and it never fails to bring a smile to my face. If they decided to bring this one back to theaters for an anniversary, you’d better believe I’d buy tickets to see it on the big screen. 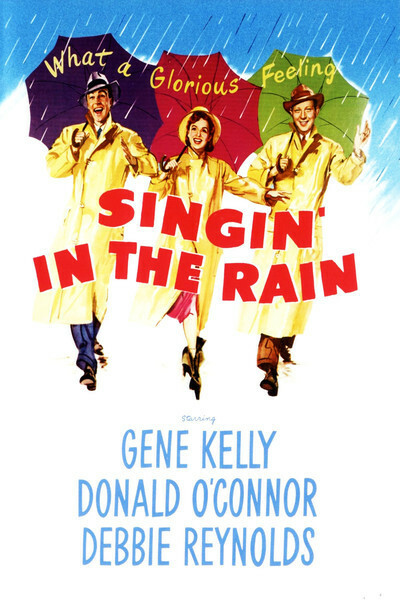 Singin’ in the Rain takes place in the late 1920s when the film industry changed forever with the hit known at the time as the “talking picture.” Movie studios and silent film stars alike were thrown into this new world of technology as the story unfolds on a trio trying to save a film project making a less than graceful transition from silent to sound. One of the things I love about this film is that it takes a look behind the camera. We see the director talking his actors through the scene as they’re filming. He’s providing point- by-point instruction including what to do, where to go, and what the characters are supposed to be feeling. We even see the actors at one point arguing with each other during filming, and as long as the scene looks the way it should, no one in the audience would know they’re not actually reciting the script. What’s really crazy is when the camera follows Don walking through the studio past four different silent films being shot within mere feet from each other. Each one of them has their own mood music playing, director yelling notes, and noises of each environment; not to mention the construction going on at the end of the line. Adding sound equipment is going to shake up how the studio currently runs things. Another thing I really love is Don and Lina’s director trying to figure out how to work with this new technology. He has to figure out how to make it work, and it’s just not happening. They hide the microphone in a bush, but they can’t hear Lina. They hide it in the front of her dress, and it picks up her heartbeat. Lina rolls her eyes as they try a third time and put it on her shoulder, but when she moves her head in a big gesture the way silent film stars previously had to, they only hear every other word. With each new problem the director’s sanity decreases a little more; he is losing his mind trying to make it work. Then the head of Monumental Pictures walks on set, trips on a chord, chastises the nearest person about it, yanks the chord, and sends Lina flying off the bench. And then when they finally manage to make a finished product, there are a world of other problems. Extraneous noise can be heard way too clearly: pearls, footsteps, Don’s cane falling on the floor, the stiff fabric of the costumes, etc. And the sounds un-syncs during the screening… This guy just can’t catch a break. 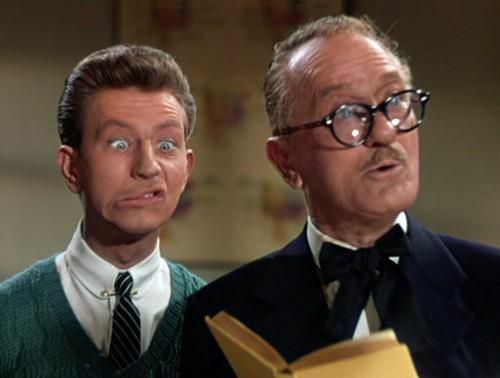 But the true gem of this movie for me, is Donald O’Connor. I absolutely love him as the comedic effect. The man was a quadruple threat: he could act, sing, dance, and be naturally funny. He doesn’t have to work at it at all. I really need to find more films he was in. I can’t imagine anyone else as Cosmo Brown. This entry was posted in comedy, musical, NR, romantic and tagged 1950s, acting, Debbie Reynolds, Donald O'Connor, Gene Kelly, Hollywood, movie industry. Bookmark the permalink. Wow! This is actually really inspiring to me. I never really viewed the movie as having that level of complexity. I mean, of course it’s a classic and all that, but I guess I could never get over how much ‘cheese’ there is. Also, as you know, I’m not a Musical fan, so that has always gotten in the way too. But your points on how the film portrays a silent film set transitioning to ‘talkies’ really is eye-opening. Maybe I’ll just have to get over the cheese.